Over the winter months here on Simple Family Travel, families who call Switzerland home, share their tried and tested family skiing destinations from all over the country. Not only will you find new places to ski, but you'll also have the details that make the day less stressful: where to park, where to rent skis, where to eat - all to make your decision easier and your time on the slopes more enjoyable. Check out all past destinations from all around Switzerland here. Today, mum of 2 Jenni takes us into the heart of Switzerland with a visit to the town of Engelberg. As an experienced skier before kids, Jenni was keen to get her kids on the slopes and found the ski area of Brunni in Engelberg to be the perfect place to start the journey. For beginners, especially younger children learning to ski, Brunni Engelberg with its Klostermatte ski area is excellent. You can easily get the train to Engelberg directly from the main station in Luzern (check out the Globi carriage!) and then take the free ski bus to Brunni. But arriving by car means you can park right next to the beginner slope (parking costs around 5chf a day). No need to then get on a cable car or gondola with all the stuff! (Have you ever tried to carry your skis and poles, your child’s skis, a rucksack, a sledge, your child who can’t walk easily in ski boots… You see my point). For me this is the biggest advantage of the Brunni/Klostermatte ski slope. Everything is right there. The area right next to the car park, called Klostermatte, caters for total beginners and improving beginners. So why not drop off your kids at the ski school and then head up the Brunni Gondola for more advanced slopes above. Or if you sign up for all-day ski school, head back down the road to the larger Titlis ski area. There is a ski school and a large slope with magic carpets (16chf for the whole day) and plenty of space on the gentle slopes. There are a few features on the slope to ‘slalom’ around and the local blue parrot mascot Globi turns up sometimes on the weekends. There is also a blue run served by a button lift for the slightly more advanced skiers. Check out Achermann Sport right by the slopes. Otherwise there are a couple of places to rent near the Titlis lifts. 6. Anything for the non skiers to do? Sledding/Snow shoeing/Winter trails? To the one side of the beginners area there is a good sled run. It is also next to the car park so no need to carry your stuff anywhere! Engelberg is full of activities for non skiers including swimming and a Spa at Eienwäldli, go cross country skiing, or opt to hike one one of many winter hiking trails. The town itself is also nice to wander through. The new family restaurant Ox located next to the slope offers the usual selection of skiing food. Try and avoid the usual peak times as it gets very crowded. They have a panoramic terrace which overlooks the Klostermatte ski area. If you want to enjoy a spectacular view after skiing on a sunny day, consider going up the Brunni cable car and visit the Berglodge Restaurant at Ritis for a coffee on their terrace looking over the alps. 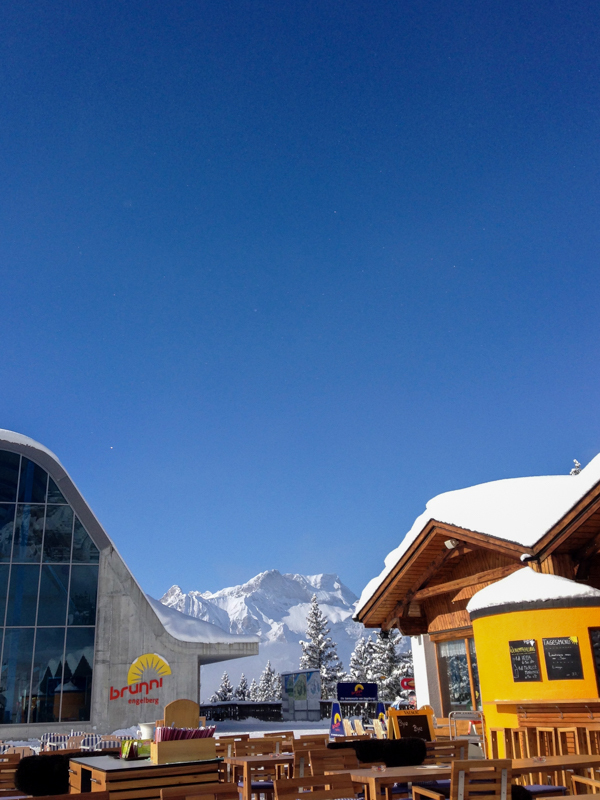 The easy access to the slope from the car and the convenient located facilities which you appreciate with younger children (toilets, café to distract a sibling for a bit, space to just play in the snow when skiing loses its appeal), makes Brunni very appealing for young families with beginner skiers. We are a family of 4. Before we had children we were already keen skiers and determined to help the girls (now 9 & 7) to learn to enjoy skiing with us. We have always tried to find areas allowing us all to ski as much as possible. When they were younger, once we’d worn them out, one of us would go with them for lunch and the restaurant, and one of us would hop in the cable car and ski on the slopes above. A big thanks to Jenni for her contribution. I can also vouch for Engelberg Brunni as being a fabulous area for beginners.